“Crime Syndicate” is one of the four fresh tees designed by Tony Aguero from Bunker Designs, and it is my favorite in this initial line. 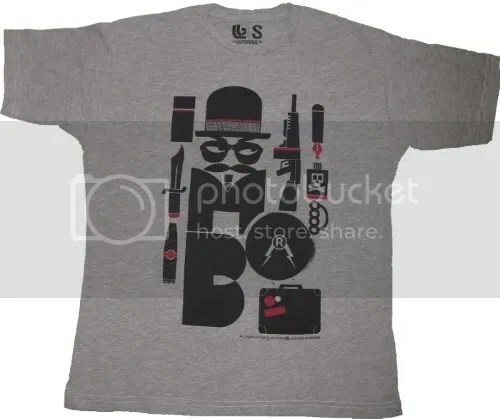 The design features a conspicuous man with a bunch of different weapons. 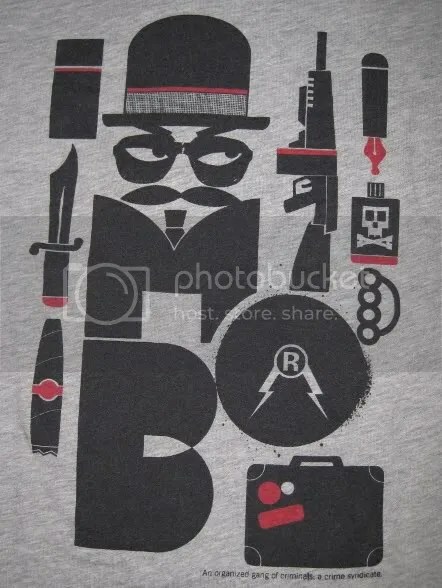 At first I didn’t realize this, but the word “mob” appears in the design in large letters. Also, at the bottom of the design, it defines this as “An organized gang of criminals; a crime syndicate.” I personally think that this is a lovely addition to the piece. When I took this tee out of its mailer, it came with a nice little custom hang tag on the bottom. All of the care instructions have been printed on this hang tag. 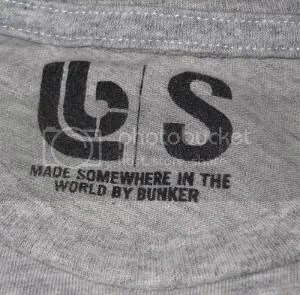 There is also a screen printed tag on the inside of the tee. No worries about scratchiness here! 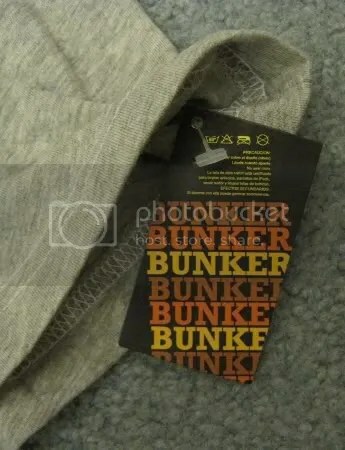 The shirts from Bunker Designs have been custom-made for the brand, and while the shirt itself is very soft, it is wider than I am used to. This tee fits more like Teefury’s Alstyle shirts in terms of roominess (I’m comparing men’s Smalls). The material feels even lighter than American Apparel 2001 tees and is more comparable to how Tultex shirts feel. I have gotten word from a member of the Bunker Designs team saying that they are currently working on a different t-shirt blank that will be slimmer with shorter sleeves. I’m definitely looking forward to seeing what the new style will be. For now, these shirts are right up your alley if you prefer classic style tees. For others who prefer slim-fitting shirts, you might want to size down until they change the t-shirts they print on. 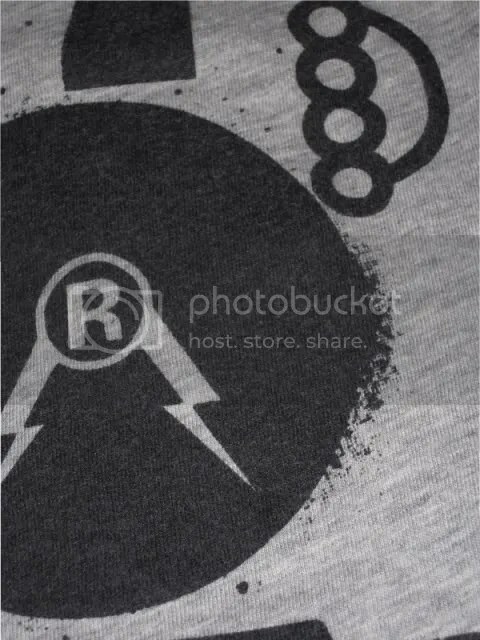 Here are some detailed images of the design. You can click on them to see slightly larger versions. The print is nice and light on the fabric, and I don’t feel it too much when I run my hand across the design. One thing to note is that after washing, the colors were no longer as vivid. 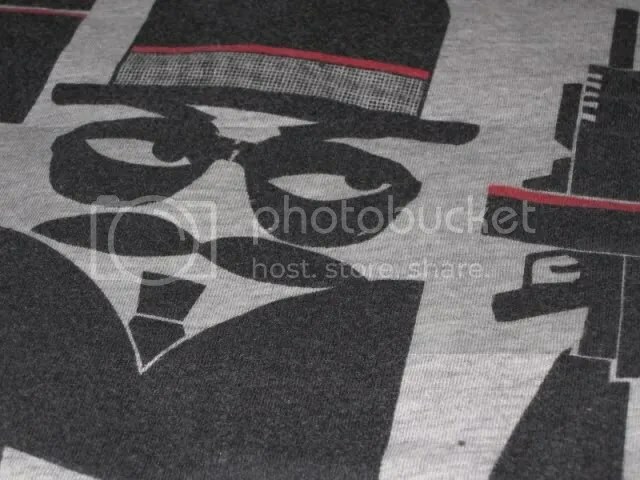 I can now see the little shirt fuzzes poking through the printed areas. So while the ink is nice and light, the tradeoff is that the black ink won’t remain as solid and dark after a cycle in the washer and dryer. Maybe if it is hand washed, the results will be different. I am finding that this seems to be a common problem with light-colored tees, but I thought that I should still point it out. Other than this, I am really enjoying how both the fabric and print feel when I am wearing the tee. Be sure to check out Bunker Designs when it pre-launches tomorrow at 5pm Eastern Time! You will be able to purchase “Crime Syndicate” for just $15, and there will be three other designs for your purchasing pleasure. One of these is a robot with vampire fangs, which I find to be pretty amusing. The new line is very promising, and I’m excited to see how this new company will grow! 5 Responses to "This Just In! : Crime Syndicate by Bunker Designs"
it fades because the printer only does one hit AND no undercoat (flashing). technically you don’t need these things when printing on a white tee or light color. problem is that when you print on darker tees, the ink gets a thicker coat to make it opaque and not see the darkness of the tee coming through. printers seem unaware of this as a benefit to the design’s appearance upon several washings. i would suggest we start asking printers to treat the light colored designs as if they were on black and pay for the xtra hits. i’d love to see someone in an airport wearing this shirt. i bet $1 he/she won’t make it past the first control point. cool design, though! Thanks for these nice words and publishing the review the day of our pre-launch. We really appreciate it. We are very exited about the pre-launch and we hope to get a good reception from the community and make their lives easier in any way. We’ll be pending of the reviews and comments in order to improve our tees. Currently we are re-designing the t-shirt line to improve the materials and made them according to the trends. Wow I love the composition of this tee.